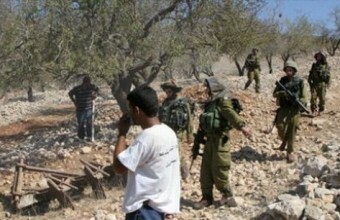 Israeli settlers set fire to olive trees in Qaryout village south of Nablus northern occupied West Bank on Sunday night. 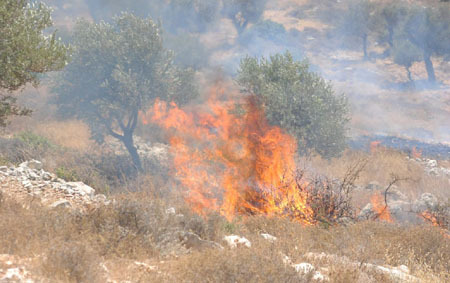 Eyewitnesses told the PIC correspondent that Israeli settlers from the neighboring Elie settlement sprayed incendiary materials on the olive trees then set them on fire. The sources added that the villagers rushed to the scene to put out the fire. Meanwhile, Israeli civil administration has handed over Monday a map confirming the confiscation of large areas of Qaryout and Jalud villages, south of Nablus, which are estimated at thousands of acres in favor of Israeli settlers and tourists. Bashar Qaryouti, a member of Qaryout village council, confirmed that the map indicates the confiscation of thousands of acres of Qaryout and Jalud villages without providing limits for the confiscated areas, pointing out that Israeli authorities plan to turn the areas into archaeological and touristic gardens. He stated that the village council is going to sue Israeli authorities for confiscating agricultural lands belonging to Palestinian farmers who still live in the village. Qaryout village is surrounded by three major settlements and four settlement outposts. The Palestinian people protests yearly against the confiscation of 21 thousand dunums of land in the Jalil, Al-Muthalath and the Naqab on the 30th of March 1976, the Israeli response resulted in the death of six young demonstrators. The Israeli occupation authorities demolish Palestinian houses and impose obstacles and constraints on building licenses for Palestinians. According to Al-Maqdisi Institute, during 2000 - 2013, the Israeli authorities demolished 1,230 buildings in East Jerusalem (the areas annexed by Israel in 1967). This has resulted in the displacement of 5,419 people, including 2,832 children and 1,423 women. The estimated losses to Palestinians of the demolition of buildings in Jerusalem total around three and half million US dollars. (This does not include the large fines imposed on so-called construction violations.) Data indicate an increase in cases where residents have to demolish their own houses: 320 people have been forced to demolish their own homes since 2000. The highest rate of self-demolition was recorded in 2010 with 70 demolitions compared to 49 in 2009. Data indicate that the total area of residential houses demolished in Jerusalem during 2013 increased in comparison with 2012. A total area of 6,196 m2 was affected during 2013: the area of non-residential establishments demolished totaled 1,150 m2. Data from Israeli human rights organizations indicate that more than 25 thousand houses have been demolished in Palestine since 1967. There were 482 Israeli locations in the West Bank (including settlements, outposts and military bases) by the end of 2013. Data indicate that the total number of settlers in the West Bank was 563,546 at the end of 2012; 277,501 settlers live in Jerusalem governorate and constitute 49.2% of all settlers occupying the West Bank: 203,176 of them live in areas of Jerusalem annexed by Israel in 1967. In demographic terms, the proportion of settlers to the Palestinian population in West Bank is around 21 settlers per 100 Palestinians compared with 69 settlers per 100 Palestinians in Jerusalem governorate. According to Israeli statistics, the total cultivated area in Israeli settlements in the West Bank during 2012 was 86 km2. The majority of land is irrigated with around 50 million m3 of stolen water from the Palestinians per year. Irrigated areas cultivated by Palestinians are about 78 km2 consuming around 30 million m3 of water per year only due to the Israeli restrictions. The areas cultivated and water consumed by settlers would provide 100 thousand job opportunities for Palestinians in the West Bank if they were able to take advantage of them. This would contribute to GDP and the share of agriculture to the economy. It would also reduce the unemployment rate. 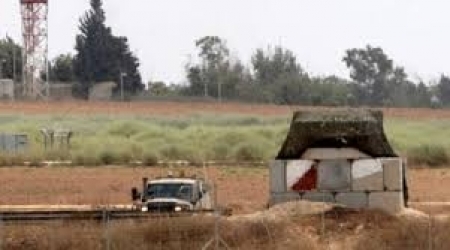 In addition, a large agricultural area is located at the borders of the eastern Gaza Strip, but cannot be utilized by Palestinians because of Israeli measures. Historical land area of Palestine reached, 27,000 km2, Israel uses more than 85% of the total area of the land, while the Palestinian comprise 48% of the total population and use less than 15% only of the land, a Palestinian therefore has less than a fifth of the area available to an Israeli. Israel exploits the Palestinian beaches of the Dead Sea and prevents Palestinians from developing tourism in this region by disposing of wastewater and solid waste from Israeli settlements and industrial zones in these areas according to the Israeli Information Center for Human Rights in the Occupied Territories (B'Tselem) . The occupation authorities have started to drill and explore for oil and natural gas in the West Bank to deprive Palestinians of these resources. The Maslamani family self-demolished on Sunday their residential barracks located in the neighbourhood of “Al-Hardoub” in Al-Tur east of the walls of the Old City of Jerusalem. Wadi Hilweh Information Center was informed that the District court judge ratified at the end of last January the Magistrate court’s decision to demolished two barracks owned by the Maslamani family in the neighbourhood of “Al-Hardoub” in Al-Tur and he refused the appeal submitted by the family and gave them 60 days to execute the decision; otherwise. The demolition will be carried out by the municipality crews on the family’s expense. Omar Maslamani told Wadi Hilweh Information Center that he and his father built the two barrack in April 2013 using Aluminium, gypsum and tin plates. 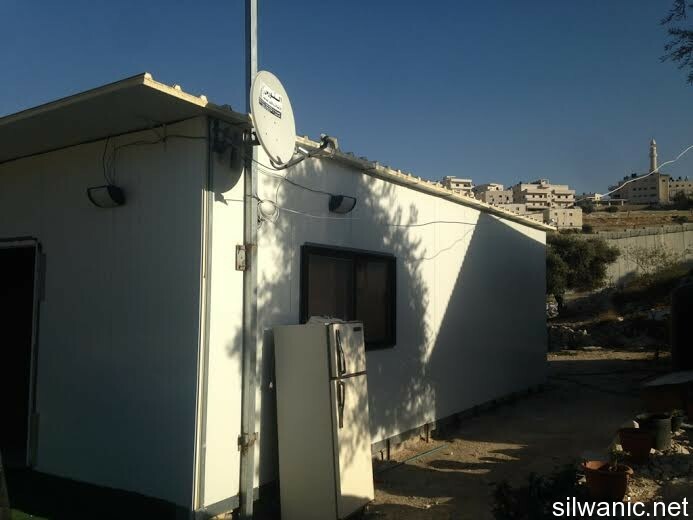 The decision made by the municipality was issued under the pretext of building without a permit; note that 8 individuals live in the two barracks including two children and a disabled girl. He added that the area of the first barracks is 60 square meters and the second is 41 square meter and they both cost around 98 thousand NIS to build. The municipality recently imposed a fee of 750 NIS for digging and sweeping the land. Omar explained that the municipality has been trying to confiscate the land that is one Dunom in order to open a main street through the land; note that the blueprint of the street was proposed to the Knesset in 2000 but was not ratified then. According to the municipality, the owner of the land can only raise sheep and poultry in the land and build a “farmers” room. The occupation municipality recently issued an order to demolish a residential building owned by Adileh in Abu Dis under the pretext of building without a permit; note that parts of the building have been established since 1959. Doctor Adileh explained that the occupation municipality issued its order on 19/03/2014 and he received it just last Monday on the 24th. The order will be valid starting the 29th of March, 2014. Adileh added that the house and according to Abu Dis Local Council and the Israeli Lands office is located within the borders of the West Bank in Abu Dis, but the occupation’s municipality claims that the land is within the borders of Jerusalem. He explained that he renovated the already established building in May 2012 and added parts to it after obtaining the necessary permits from the Palestinian Authorities. After completing the constructing, the Israeli forces raided the house and handed him an administrative demolition order in April 2013. He also added that he has been trying to obtain a license from the Israeli municipality and was surprised when he received the demolition order few days ago. 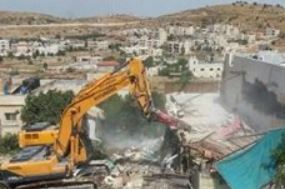 The occupation municipality’s bulldozers demolished on Wednesday morning a residential building in Khallet Al-Ein in Al-Tur east of the Old City without prior notice under the pretext of building without a permit. The Israeli forces raided Al-Tur at 6 a.m. and surrounded the building that is owned by Ghadeer Ajram Abu Ghalyeh and then started the demolition process on top of the building’s contents. Wadi Hilweh Information Center was informed that the building consists of “Al-Rahmeh” Mosque that is 100 square meters, a 200-square meters medical center, storages and two residential apartments with an area of 300 square meters; note that 11 individuals live in the two apartments. The owner pointed out that the building has been established for three years and he was able to obtain an order on Wednesday to stop the demolition; note that the District court was supposed to help a session regarding the demolition of the building at the beginning of May. Abu Ghalyeh confirmed that the demolition was done without prior notice and the forces surrounded the building and evacuated the residents then carried out the demolition on top of the furniture. He also noted that the second time the building gets demolished as it was previously demolished in 2007. Abu Ghalyeh explained that the locals of Khallet Al-Ein have been trying to obtain building permits for 18 years and the mayor decided that this is a residential area but the Israeli Minister of Interior refused his decision. Jeff Halper is the Director of the Israeli Committee Against House Demolitions. The "Judaization" of Jerusalem and the West Bank continues apace, despite (and in fact because of) the so-called "Kerry initiative." Over the past few months the Israeli government has intensified its campaign of demolitions in Jerusalem, in the strategic E1 area between Jerusalem and the Maale Adumim settlement, in the South Hebron Hills and in the Jordan Valley. 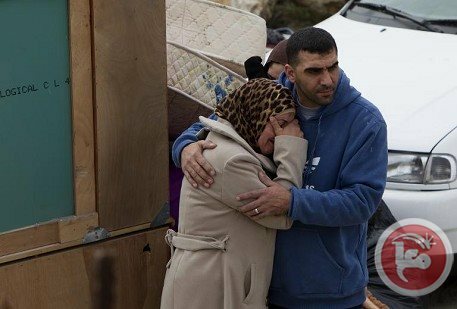 According to UN figures, 231 Palestinians have been displaced from their homes in the first two months of 2014, During that short time 132 structures were demolished, a pace outstripping that of 2013, when 1,103 structures were demolished and 663 people displaced, itself the highest level in the past five years. Besides homes, "structures" refers as well to livestock pens, fences, water reservoirs and even public buildings such as schools, all vital to the livelihood and communal life of Palestinians. Overall, the Israeli Committee Against House Demolitions estimates that since 1967 some 29,000 Palestinian homes and livelihood structures have been demolished in the Occupied Territories -- and that doesn't include the ongoing demolition of thousands of other homes of Palestinian and Bedouin citizens of Israel. At the same time, of course, the Israeli government has announced the construction of thousands of new homes and infrastructural projects in the settlements of the West Bank and East Jerusalem. 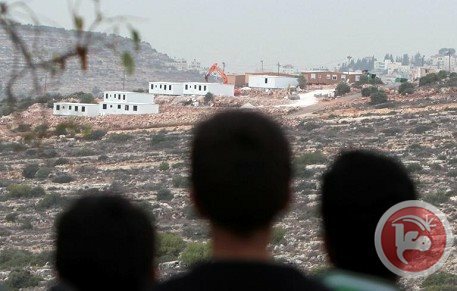 Thus, while recently approving another 1,500 housing units in the illegal East Jerusalem settlement of Ramat Shlomo, 558 in other East Jerusalem settlements and 3,500 more in the West Bank, it issued demolition orders for 2,000 housing units in the nearby area of Ras al-Khamis and the Shuafat refugee camp. "Demolition" is only the visible part of the problem, of course. Displacement caused by lack of access to water or agricultural land and the actual expropriation of lands necessary for the continuation of Palestinian communal life is the real point of the demolition policy. In East Jerusalem, the Israeli government is establishing a "national park" on the lands of Issawiya and al-Tur to the northeast of the city, fragmenting East Jerusalem communities while creating a "bridge" between Israeli Jerusalem and Maale Adumim -- creating a so-called "Greater (Israeli) Jerusalem" that divides the West Bank on half and effectively ends any prospect of a contiguous Palestinian state. Following a process Israel officially calls "Judaization," 40 percent of the Jewish residents of Jerusalem now live in the Palestinian part of the city, in expansive settlements that confine Palestinians to tiny ghettos. Palestinian Sheikh Jarrah is being depopulated and replaced by Israeli Jews; recently the municipality announced the construction of a massive twelve-story "campus" of dormitories and classrooms for Jewish yeshiva students in the heart of the neighborhood. Silwan is also in the process of being erased from the map: it has already been renamed "The City of David," declared an Israeli national park and "Judaized" by dozens of settler families. 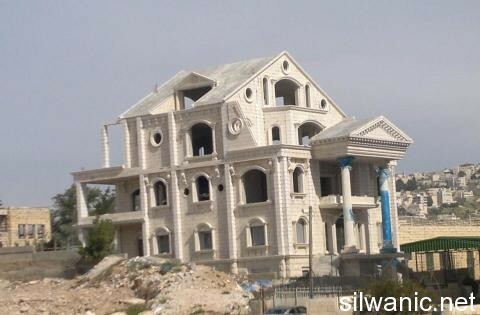 The government plans to demolish 88 Palestinian homes in order to make way for parking lots and park facilities. In other parts of Jerusalem -- al-Tur, for example, or Jabal Mukkaber, Sur Baher and Beit Hanina -- demolitions occur at a slower but steady pace, "under the radar" to avoid international criticism but enough to prevent Palestinian families from improving their standards of living. Here the message is the flip-side of "Judaization": de-Arabization. Keeping the city's Palestinian population -- a third of Jerusalem's population -- living in miserable conditions (one has simply to compare the infrastructures of East and West Jerusalem) is yet another part of the strategy of displacement. It has yet another wrinkle as well. Israel has a declared, racist policy of maintaining a 72 percent [PDF] majority of Jews over Arabs in Jerusalem. How does it achieve that? Well, its dual policy of demolishing homes while not issuing building permits to Palestinians has led to a shortage of some 25,000 housing units in the Palestinian sector. That has pushed up the price of scarce housing available to Palestinians, forcing thousands -- 70 percent of East Jerusalem Palestinians live under the poverty line -- to seek more affordable housing in Arab neighborhoods just beyond the gerrymandered Jerusalem border, such as Bir Naballah, al-Ram, Hizma, al-Eizariya, or Abu Dis. By shifting the "center of their lives" from Jerusalem, however, these hapless Palestinians, who are not citizens of Israel but only "permanent residents" of Jerusalem, lose their residency rights and are barred from re-entering the city, even if they are employed there. HaMoked forced the Ministry of the Interior to reveal that, since 1967, 14,309 Palestinians have lost their residency, thus furthering the process of "Judaizing" the city. In 1967, between 2-320,000 [PDF] Palestinians lived in the Jordan Valley; today only about 55,000 remain, and of those only 15,000 remain in the Area C outside of the city of Jericho -- an area comprising 30 percent of the West Bank -- half of them Bedouin. The communities in Area C, which under tremendous pressure of demolition and displacement. A full 94 percent of their agricultural land is off-limits to them. 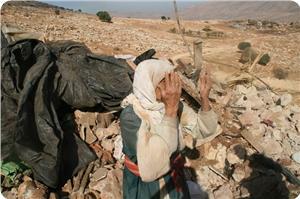 The destruction of Palestinian homes does not occur only in the Occupied Territories, of course. 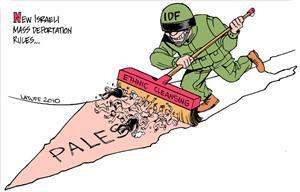 The entire country is being Judaized; Palestine transformed into the Land of Israel. In recent years the Israeli government has demolished three times more homes inside Israel [PDF]than it has in the Occupied Territories. 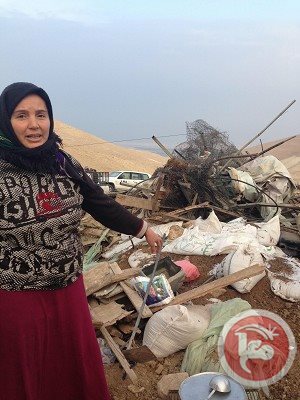 The Bedouin-Palestinian community of al-Araqib, whose residents are Israeli citizens, has now been entirely demolished 61 times (and each time rebuilt by the residents and their supporters). Israeli officials often say: "We never finished 1948." That doesn't mean they have given up trying. Hebrew media revealed that Israeli Foreign Minister Avigdor Lieberman has received a few weeks ago a classified legal opinion authorizing the transfer of the Triangle and the Wadi Ara regions, in 1948 Palestine, along with their entire population to a Palestinian state in any future permanent peace agreement. The opinion argued that transferring populations would only be in line with international law if executed with the consent of those being transferred, if it did not leave any of those transferred without any kind of citizenship and if it provides an appropriate compensation mechanism similar to the one received by the settlers who evacuated settlements in the Gaza Strip. Lieberman said during a meeting with Foreign Ministry ambassadors in January "a comprehensive settlement with the Palestinians should include settling Israeli Arabs", and claimed that this land and population swap plan was not a "transfer" but aimed at shifting the border. Haaretz newspaper reported on Tuesday that several days after Lieberman's speech, and when US Secretary of State John Kerry started working on a framework agreement for the negotiations, Lieberman asked his ministry's legal division to prepare a legal opinion on his plan. An 18-page legal briefing was prepared by Ehud Keinan, the foreign ministry's legal adviser, in February. It is entitled Territorial Exchange: transfer of sovereignty over populated areas in the framework of a final arrangement with the Palestinians - legal aspects. Keinan claimed that "transferring populated areas from a sovereign state to another as part of a permanent solution even without the population's explicit consent or a referendum is acceptable under international law as long as it offers residents clear citizenship after the transition." “Lieberman’s plan, like the opinion issued by his ministry’s legal advisor, has a single overarching goal: turning Israel into a pure ethnic and religious state. Therefore, the goal of this plan cannot be described as anything other than ethnic cleansing – even if not by force of arms,” Ha’aretz said in an opinion published on Wednesday. Israeli occupation bulldozers razed, Wednesday morning, a large area of Palestinian farm land in the Um Neir area of eastern Yatta, in southern Hebron city. Susiya Mayor, Jihad Nawajaa, told Ma'an News Agency that several bulldozers, escorted by Israeli military vehicles, leveled private Palestinian land in the village, taking out several fruiting trees near Susia settlement. Israeli forces blocked off the area and declared it a closed military zone, preventing farmers from accessing their lands. This action coincided with the arrival of the British consulate delegation which is due to visit the Susia area to look into the living conditions of Palestinians residing there, and the Israeli violations against them. 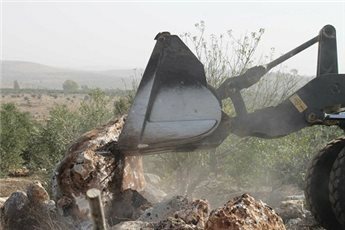 Israeli occupation forces (IOF) unleashed their huge bulldozers in a hamlet near Yatta town, south of Al-Khalil, on Wednesday destroying ten dunums of land planted with almond and olive trees. Activist Ratib Al-Jabour told the PIC that a big number of IOF soldiers provided protection for the bulldozers as they went on the rampage. He said that the soldiers claimed that the area was a military zone and fell in area C and was thus under their full control according to the Oslo accords. 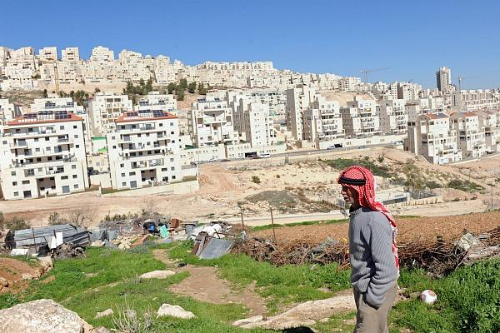 The repeated bulldozing and confiscation of land in Yatta aims at forcing inhabitants to abandon their land and to allow settlements to expand. Israeli Military bulldozers demolished Wednesday early morning a Palestinian civilian block in the occupied Jerusalem. ALRAY correspondent reported that Israeli bulldozers escorted by Israeli occupation forces raided al-Tour village to the east of Jerusalem , cordoned off and destroyed a two-storey house , mosque and a clinic. The house belonged to Ghadir Abu Ghalia in which more than 14 people live. 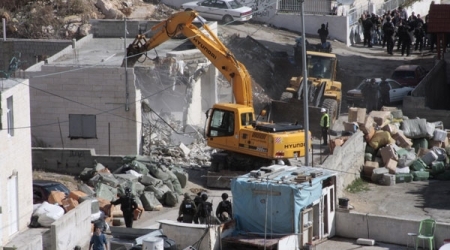 Israeli occupation authorities issued an administrative order to demolish the house, despite of the court hearing to review the decision on the first of next May. The owner of the house shocked by the order. Israeli soldiers invaded the Khallit al-Ein neighborhood, in the at-Tour town in occupied East Jerusalem, and demolished an apartment building that belongs to a local family. The building also contained a mosque and a clinic. The building belongs to resident Ghadir Ajram Abu Ghalia; dozens of soldiers, undercover soldiers and police officers invaded the area and surrounded the building before forcing the residents out and violently removing their furniture and belongings. Ghadir said the soldiers demolished the building without any prior notice, and that the demolished structure is a two-story 700 square/meter building has a mosque, a clinic, two apartments, and storage rooms. Eleven persons were rendered homeless. The building was constructed nearly three years ago; the family spent 18 years filing legal documents and permit applications just to get a structural plan approved. The City Council approved the construction as the land in question is designated for constructions, but the Ministry of Interior denied the application altogether. On Tuesday, the family obtained a High Court order to delay the destruction of the property, and the Central Court was supposed to discuss the case in May, but the city council went ahead and demolished it. This is the second time Israeli demolishes the building, as it was first demolished in 2007. 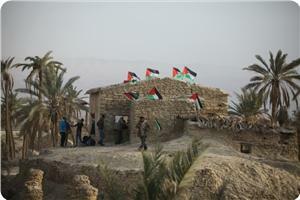 Israeli forces, on Monday, served 18 families from Wadi Buzeq, in the northern Jordan Valley, with orders to evacuate their homes tomorrow (Tuesday, March 25, 2014), under the pretext of carrying out military training. Representative of the Wadi Buzeq, Imad Harbout, according to the PNN, said that Israeli forces raided the area and gave evacuation orders to 18 families, adding that the residents were ordered to evacuate their homes from 7 am till 4 pm for military purposes. The employees of the Antiquities Authority forced on Sunday the residents of Wadi Hilweh in Silwan to stop the renovation works of a supporting wall that collapsed last month on top of the citizens’ houses under the pretext of the presence of antiquities in the area. Wadi Hilweh Information Center said that an employee of the Israeli Antiquities Authority along with special guards raided the house of Siam family where renovation works are being done to a supporting wall and requested them to immediately stop the works under the pretext of the presence of antiquities in the area and insisted on the necessity of the presence of an employee from the Antiquities Authority during the renovation and that the residents have to pay him. The Center added that the police raided the area while the Antiquities employees where there and also requested to stop all the renovation works. The residents of Wadi Hilweh who were affected by the collapse of the supporting wall noted that the Jerusalem municipality requested them to do the renovation for the wall within a month and threatened to impose financial fees otherwise; note that the residents are doing the renovation on their own expense after the municipality denied being responsible for the collapse of the wall and under the pretext that it is a “private” wall not a “public” one. It is noteworthy that the supporting wall collapsed on 26/02/2014 due to the Israeli excavations underneath the houses and causes damages to five family houses (Salaymeh, Bader, Tawil, Ja’bari and Siam). The collapse blocked the entrances of the houses and they residents are now entering their houses through the courtyards of other houses; note that the wall is 15 meters wide and 3 meters high.